In the winter of 1948, eighteen-year-old Leland Henry was completing his senior year at Oakwood High School in Dayton, Ohio and contemplating his future before entering The Ohio State University in the fall of 1949. He wasn’t sure what he wanted to do but there was a definite streak of entrepreneurism in his life. When his father died, Lee’s mother Helen Henry married Dayton entrepreneur Loren Berry who had founded the Yellow Pages form of advertising in 1910. Growing up in the home of his stepfather Loren Berry, Lee was exposed to the constant conversation about new business ideas. While Lee did not know what the future held for him, one of the things in the air at the time, even in the cold winter of Ohio, was the South Pacific. In the late 1940s, one of the leading phenomena in popular culture was interest in the South Pacific and Polynesian culture. Soldiers returning from World War II brought with them stories of the war in the South Pacific. The interest in the South Pacific helped James Michener’s collection of stories Tales of the South Pacific win the 1948 Pulitzer Prize and was the basis for the 1949 Broadway musical South Pacific. In addition to the returning WWII veterans, several other factors contributed to the mid-century American interest in Polynesian culture. Post-war America saw the rise of the middle class as an economic force with ever-increasing affordability of travel. In particular, newly established air travel to Hawaii helped to propel the nation’s interest in all things tropical and the eventual statehood of Hawaii in 1959. Polynesian design began to infuse every aspect of the country’s visual aesthetic, from home accessories to architecture. Single family homes, apartment complexes, business and even large shopping and living districts of some cities were heavily influenced by Polynesian aesthetics. Although Lee was not sure what he would do after college, he did know that he wanted to visit his eccentric aunt Gertrude Embry who lived in Los Angeles in the coming summer before entering OSU in the fall. Therefore, after graduating from high school, Lee drove to Los Angeles in the summer of 1949 to stay with Gertrude and her husband Higsby. Higsby Embry inherited a good deal of money and the couple lived an exotic lifestyle. Higsby owned a 75-foot-yacht called Rainbow and they would often cruise to the Catalina Islands off the coast from Los Angeles and party until all hours of the night and sleep until noon. They owned a home at the eastern end of the Santa Monica Mountains in the Las Feliz neighborhood of Los Angeles. Their home was right next door to the famous old movie star Adolphe Menjou and just down the hill from the Griffith Park Observatory. Higsby and Gertrude had some monkeys and one time their monkeys escaped and were found up at the observatory. While in Los Angeles, Lee took a few trips to Catalina Island on the Rainbow. Most importantly for his future, Gertrude and Higsby took him to a number of the new exotic restaurants in LA. He visited restaurants like the Brown Derby, Musso & Franks and Lawry’s which were all setting new restaurant trends, going against the rise in franchise restaurants like McDonalds, Denny’s and Dunkin’ Donuts. The most exotic restaurant in Los Angeles at the time was a Polynesian-themed restaurant named Don the Beachcombers. The restaurant was founded in 1934 in a vacated tailor shop of Hollywood Boulevard by Ernest Gantt, a twenty-seven year adventure-seeker who had travelled around the world in 1926 visiting islands in the Caribbean and South Pacific and collecting souvenirs and stories from them. In 1931, the proto-beatnik came to LA when his money ran out looking for something to do. Gantt made do in the Depression economy through his wits and odd jobs working in restaurants in Chinatown, parking cars at commercial lots, and doing a bit of freelance bootlegging in the months before Prohibition ended. Sociable and charming, he befriended such Hollywood personalities as David Niven and Marlene Dietrich and through them found occasional work as a technical adviser on films set in the South Pacific. 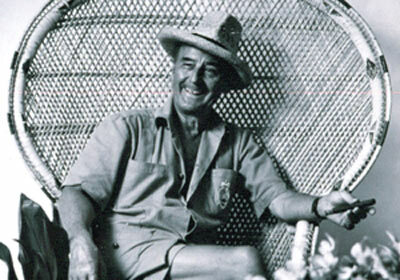 Directors evidently were impressed not only by his knowledge of the region but also by his collection of South Pacific artifacts, which could be borrowed for set props. By 1937 Ernest Gantt’s Polynesian restaurant in LA had outgrown the tailor’s shop and Gantt moved to a larger spot in Hollywood. He added more South Pacific flotsam and imbued the place with a tropical twilight gloom. The joint became so much part of his personality that he legally changed his name several times, first using Donn Beach-Comber, then Donn Beachcomber and finally settling on Donn Beach. The new name was Ernest Gantt’s vision of himself as a mellow, dropped-out aesthete, a sort of Gauguin who’d moved to Tahiti permanently without bothering to bring along any paints or canvases. After visiting Don the Beachcombers with his aunt and uncle in the summer of 1949, a vision began to crystalize in Lee’s mind on what he might want to do in the future. It wasn’t much more than a vision but there was the seed of something planted in his mind that summer after visiting his aunt and uncle and seeing Don the Beachcombers. In the fall of 1949, with the popular music from South Pacific swirling in the air, nineteen-year-old from Lee Henry entered The Ohio State University in Columbus, Ohio. The next few years were filled with traditional college activities and notable things like the 1950 “Snow Bowl” where Ohio State played Michigan in the middle of a full-scale blizzard, five inches of snow on the ground and snow whistling through the air, borne on a 29-mile-per-hour gale. It was the worst blizzard in 37 years in Columbus, and the Ohio capital easily defended its title as the football craziest town in the nation. The worst part of the game was that Michigan beat OSU 9 to 3. In 1954, Lee graduated from The Ohio State University and traveled to Europe for a few months contemplating his career. When he got back, he began work at the staid old Union Department Store in Columbus. 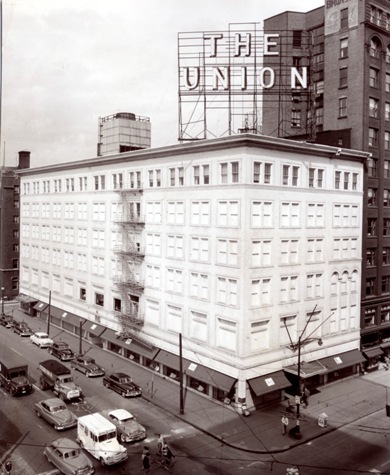 It was called “The Union” because founder S.M. Levy started the business in Chicago during the Civil War and the Union of the north was on everyone’s mind. Lee began work as a salesman in the men’s department of the store. After a short time, he became bored with the job and realized he is not made for a career in the retail industry. And too, he becomes a little worried about his male supervisor at the store who wanted him to model underwear after hours. A good friend of Lee’s at OSU was Bill Sapp and the two began discussing getting into business together. In 1955, they scraped enough money together to open The Top steakhouse in Columbus. While he enjoyed running the Top, Lee could not forget the exotic Polynesian restaurant in LA he had visited with Gertrude and Higsby. During the next year, Lee made a number of trips to visit other Polynesian restaurants around the nation. The American interest in Tiki culture and Polynesian-themed restaurants was exploding at the time. Lee made more trips to LA to see Gertrude and visit other Tiki-themed restaurants. The Los Angeles Trader Vics opened in Los Angeles in 1955. 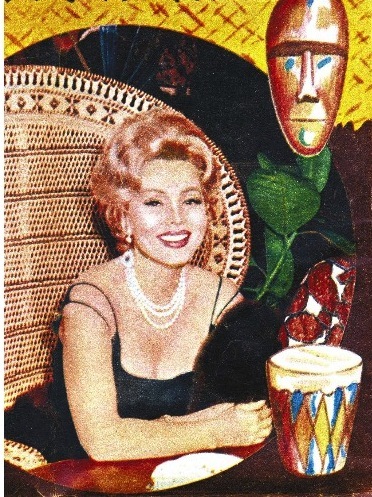 Besides Trader Vics and Don the Beachcombers, there were other popular Polynesian-themed restaurants in Los Angeles like the Zamboanga South Seas Club and the Pirate’s Den. All were doing a roaring trade. Los Angeles was particularly fertile ground for this growing new restaurant trend called “themed” restaurants. At the time, most Angelenos were immigrants from somewhere else, so the city had little of the sort of shared traditions and conventions that governed how things were done elsewhere. And most importantly, LA was also full of out-of-work movie set-designers who found new employment in making restaurants into movie sets. While Lee was influenced by the Los Angeles Polynesian restaurants, his final inspiration came from Florida not California. In 1957, with The Top steakhouse operating in Columbus, he visited the largest Polynesian restaurant in the world in Fort Lauderdale, Florida called the Mai-Kai. 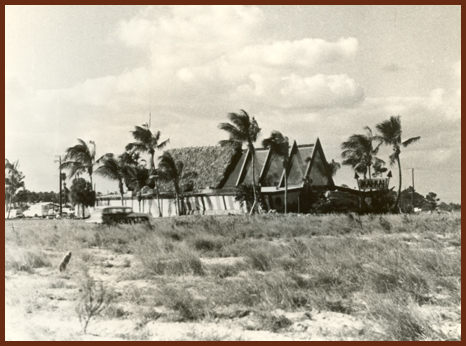 The Mai-Kai opened in December of 1956 in an open field on the two-lane Federal Highway on the outskirts of Fort Lauderdale, Florida. Brothers Bob and Jack Thornton who were inspired by Don the Beachcomber’s restaurant as children created it. When they opened the Mai-Kai they hired away number two chef from the Chicago Don the Beachcomber’s restaurant, Kenny Lee, and the number two bartender Mariano Licudine as well as the head Maitre d’ Andy Tanato along with many staff members. Their original design cost three-hundred-thousand dollars. It is the most expensive restaurant built in 1956. In its first year it earned over one million dollars, becoming one of the most successful restaurants of its time. Fort Lauderdale in the late 50’s was a seasonal place, catering mostly to “snow-birds” and in the first few years the Mai-Kai was only open during the Winter Tourist season. Upon his return to Columbus, Lee and his partner Bill Sapp started their own Polynesian-themed restaurant. However, it wasn’t anything on the grand scale of the Mai-Kai or the LA restaurants. It was really no more than a grass shack. 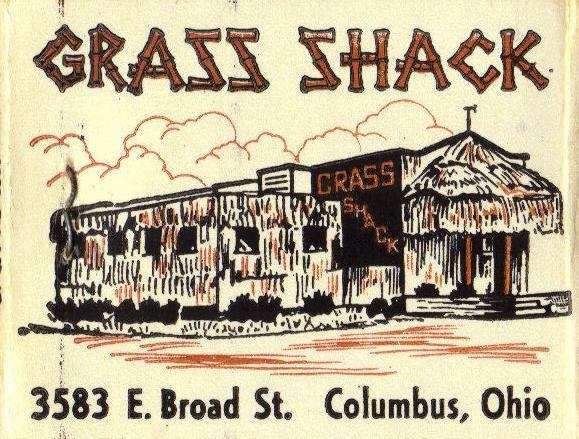 In fact, it was called The Grass Shack and it was located at 3583 E. Broad Street. From the start it had a rough clientele. Lee had learned much from observing the operations of the other Polynesian restaurants, especially the Mai-Kai in Florida and how the two brothers had brought great people with restaurant talent to their operation. As a result, the Kahiki began advertising in a number of the Chinese language papers in San Francisco looking for help. Later, Lee would hire Craig Moore, right out of the famous Cornel School of Hospitality Management, to manage his future Polynesian restaurant. Even thought there was a certain “planned obsolescence” for the Grass Shack, its end was brought about quickly by a fire that burned it down on June 14, 1959 – Bill Sapp’s birthday. Bill had gone home when one of the perpetual parties were going on at the Grass Shack. He got a call from Sondro Conti, his bar manager and drink inventor who told him the place had burned down. Bill and Lee’s plans to open their Polynesian-themed restaurant were put into high gear with the Grass Shack fire. By this time, Tiki culture was in full swing. Hawaii was admitted to statehood this year and Luaus were a popular theme for parties in the suburbs as tropical-themed drinks began appearing at bars and restaurants. In August of 1960, a year after the Grass Shack fire, the Columbus Dispatch wrote the “Foundation is completed for the Kahiki, a Polynesian supper club to be located at 3583 E. Broad Street. It is expected to be the largest restaurant of its type in the world.” The Kahiki was being built on the site next door to the old Grass Shack. The restaurant was designed by Columbus architect Coburn Morgan at a cost of $1 million dollars. It would be able to hold over 500 guests and would have waterfalls, tanks of fish, live birds, large drums, and an iconic monkey fountain known as “George.” At the center of the building was a giant stone Moai fireplace. The year 1961, brought two important events into Lee Henry’s life. The Kahiki opened and Lee was married to Marilyn Mansfield. In the coming years, Marilyn would help much in the operations of the Kahiki and produce two beautiful daughters for Lee, Karen and Dawn. The vision of a restaurant Lee first saw at Don the Beachcombers in LA, was now a reality. Doug Motz, past president of the Columbus Historical Society notes that the design of the building was based on men’s meeting houses of New Guinea and the details featured along the curved roof were found on many of the war canoes of the region. Pelicans and fish lined the apex of the roof, thought to be symbols of plentiful good food. Two replicas of the Easter Island heads stood guard at the doorway that was lined with murals to ward away evil spirits. 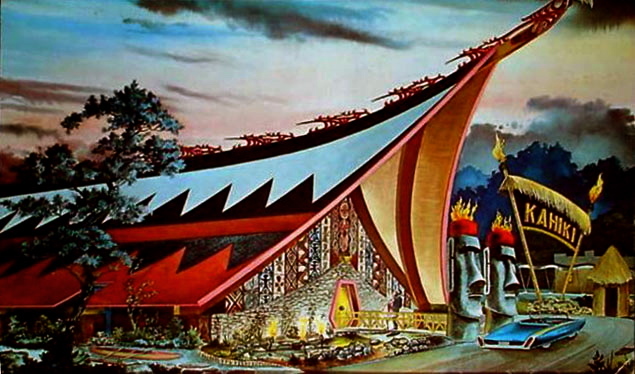 Shaped like a Polynesian fighting boat with 40-foot-tall giant flaming Moai Heads outside the main doors opening into a tropical rainforest with a reproduction of a typical Pacific Islander tribal village. 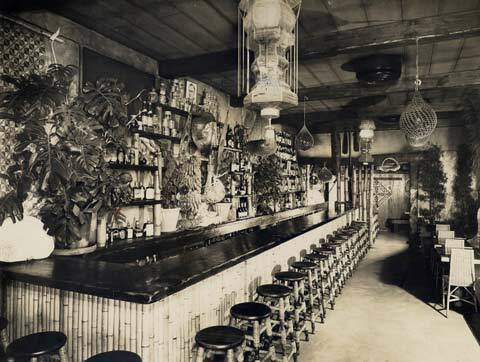 Inside the Kahiki, patrons became immersed in a total world of the South Seas and could order their choice of exotic fare and island drinks such as Malayan Mist, Blue Hurricane, Instant Urge, Maiden’s Prayer, Misty Isle, Jungle Fever, Head Hunter, Zombie and the Smoking Eruption. Each one of these cocktails had its’ own sculpted mug designed just for the drinker who could then purchase it from the gift shop and take it home as a souvenir. Bill Sapp’s wife herself made the original mug for the Zombie. 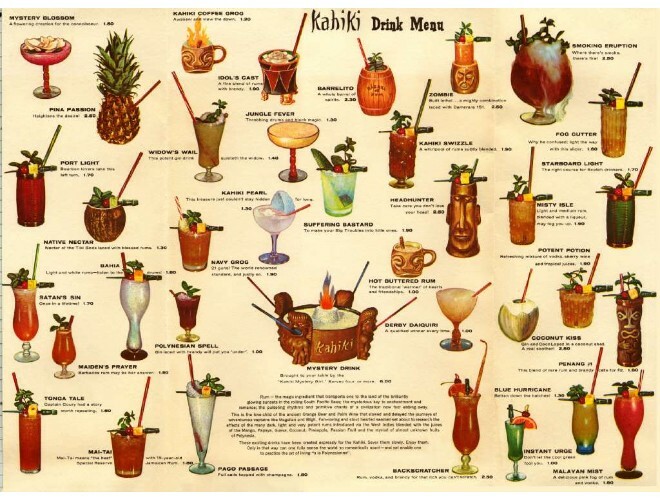 The various bars of the Kahiki used up to 1,000 pineapples and 2,000 bottles of rum monthly to keep up with demand. As amazing as all these drinks were, the ultimate Kahiki drink was the “Mystery Drink” which could serve 4 people and contained 8 ounces of rum and brandy. It was served in a bowl with a smoking volcano in the middle and brought by the “Mystery Girl” who ceremoniously danced it to one’s table after being summoned by a giant gong. The pretty, scantily clad “Mystery Girl” who brought the “Mystery Drink” had a number of male fans but perhaps her biggest fan was the television celebrity Arthur Godfrey who was taken with her on his visit to the Kahiki and took her back to California with him. 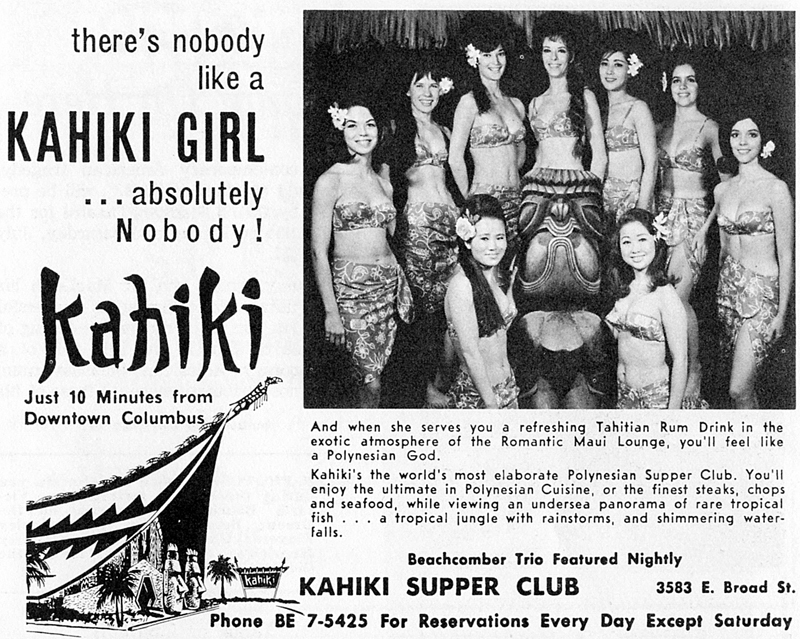 As the 60s went by, the Kahiki gained in popularity until it was known worldwide as one of the great themed-restaurants in the world. Besides Arthur Godfrey, many other celebrities such as Milton Berle, Andy Williams, Robert Goulet and Zsa Zsa Gabor visited the restaurant while in Columbus performing Summer Stock Theater for the Kenley Players at the Vets Memorial Theater. 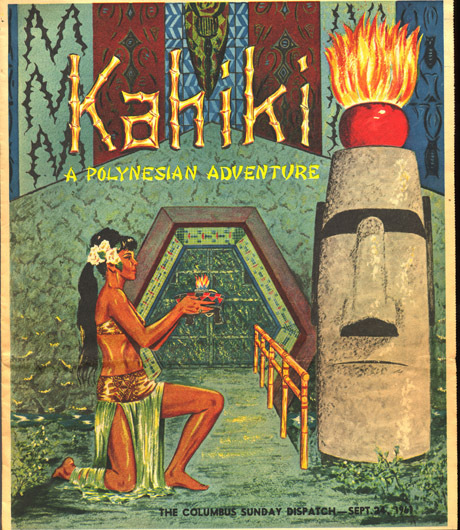 Despite years of incredible popularity for the Kahiki, trends in culture at the beginning of the 70s were changing and Tiki culture was declining in popularity. The novelty of the South Pacific and Polynesian culture was fading and new trends were emerging. 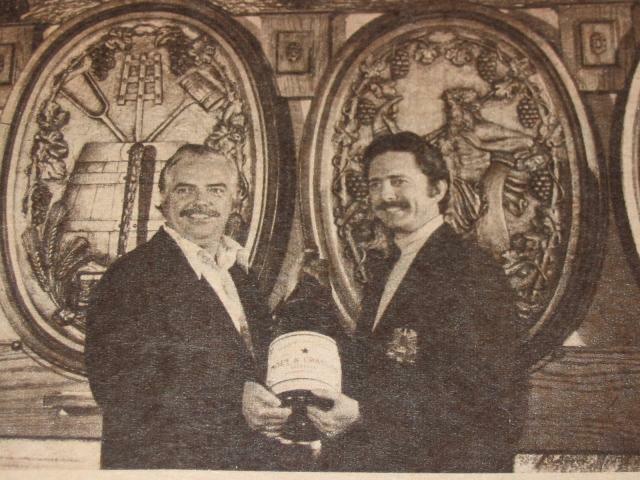 In 1972, Bill Sapp and Lee moved away from their exclusive focus on the Kahiki when they opened their second themed restaurant in Columbus named the Wine Cellar. While the Wine Cellar proved to be a very successful restaurant, Lee’s full-time attention to the restaurant business was waning as his attention to his growing family and other interests increased. During this time, he took his family on a number of trips around the country and world. He and Marilyn bought a condo in Aspen where the family went skiing in the winter. When he was young, Lee earned a multi-engine and instrument pilot license and now used it much more than ever. He was an avid sailor and sailed to many places around the world. He was also a scuba diver, bicyclist and exercise enthusiast. 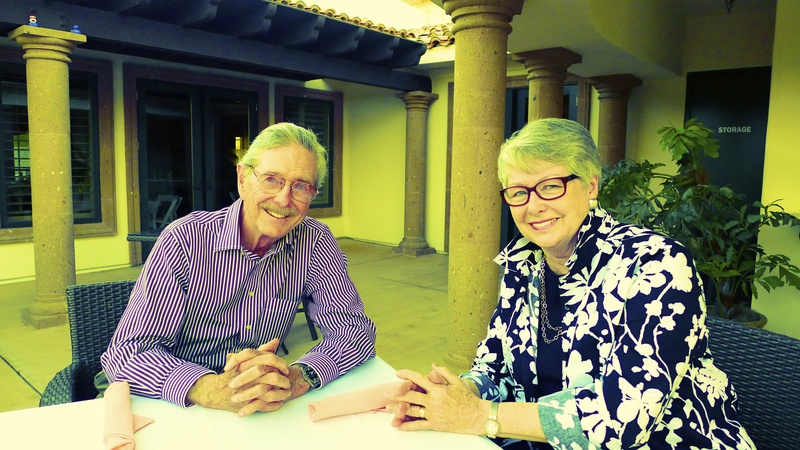 Eventually, Lee and Marilyn sold their home in Aspen and bought a home in Ketchum, Idaho. Lee loved many things about Ketchum, the home of Ernest Hemingway. But probably his most favorite things were spending a lot of quality time with Marilyn and his new grandson. His daughter Dawn had moved to Ketchum a number of years before Lee moved there and it was wonderful being with her and his grandson. In August of 2015, Lee returned to Columbus with an illness and passed away at his home on September 22. Lee will probably be remembered mostly as the creator of the legendary Kahiki that exposed mid-Ohio to the exotic South Pacific culture of Polynesia. And this of course this is all a good thing to be remembered by. But I am sure that many friends of Lee will remember him for different things. Like his memory for me, one of Lee’s nephews. I visited the Kahiki a few times and loved it like those who went there. But most of all, I remember Lee for the unique person he was rather than the incredible place and experience he created. More than anything else, he was always interested in life and all the humorous little quirks of life that went with it. He was always exploring new things and curious of everything. Lee always wanted to know more about everything. Whether it was the workings of a new television monitor or the latest product from Apple. This was the uncle I knew and loved so much. I was not alone in this love of Lee. So many loved him and were amazed at how he lived life, squeezing out of it all it might offer like some piece of fruit. So many loved him, even if they never knew he was the guy who created legendary places like The Top, the Wine Cellar and the Kahiki. They knew various “facets” of Lee but few ever understood the entire “diamond” called Lee Henry. John is the nephew of Lee Henry and grew up in Los Angeles a few blocks away from Trader Vics in the Beverly Hilton Hotel. He is President of Desert Screenwriters Group (www.desertscreenwritersgroup.com) and GreatHouse Stories (www.greathousestories.com) and has recently moved from Palm Desert to Columbus, Ohio.